Weeki Wachee is a one-of-a-kind underwater adventure park, that features an underwater spring-fed theater with underwater mermaid shows playing daily. Bryan was absolutely fascinated by the underwater play, "The Little Mermaid" and he sat quietly through the whole thing. The mermaids perform underwater the scenes of the Little Mermaid story, occasionally getting air through several submersed air tubes. The wicked witch was scary but was defeated in the end! We went on a short eco-tour boat ride on the Weeki Wachee river, and saw fishes, turtles, herons and more while we enjoyed the ride. Bryan enjoyed the up-close wildlife encounter with a snake and a baby alligator. He got to pet the baby alligator all by himself!He loved it. Visitors can rent canoes or kayaks here and paddle up the crystal clear spring fed river for miles enjoying the serene environment. June 8, 2009 – August 30, 2009:Monday – Sunday 10 a.m. – 5 p.m.
Once a private attraction, the state park's took over operations in November of 2008, this amazing underwater mermaid show has been entertaining visitors, since 1947. While in the area, here is a great place to play and stay! 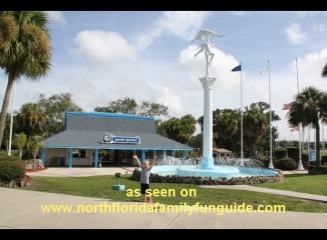 In Weeki Wachi, Spring Hill, Pine Island Park is right at the end of a long winding road out to the Gulf of Mexico, this quaint little park has a little cafe' a playground and a beach with wonderful shallow water perfect for little ones. Mary's Fish Camp, just down the road, is a great peaceful retreat on the river. Located right on Mud River, feeding into the Gulf of Mexico, this is a popular destination for travelling fishermen and families. They rent Cabins, and RV sites, have a dock for your boat and more.